Wall calendars are available in multiple sizes, papers and month counts. Desk calendars are available in a horizontal 8.5” x 5.5” size on premium papers with standard folding tent base for desktop display. Don’t miss a single day of marketing by printing calendars. If you want to simultaneously brand your company and market directly to your customers, there’s no better way to do both efficiently and effectively than with calendars printing. Nothing else puts your message front and center to so many people every single day. 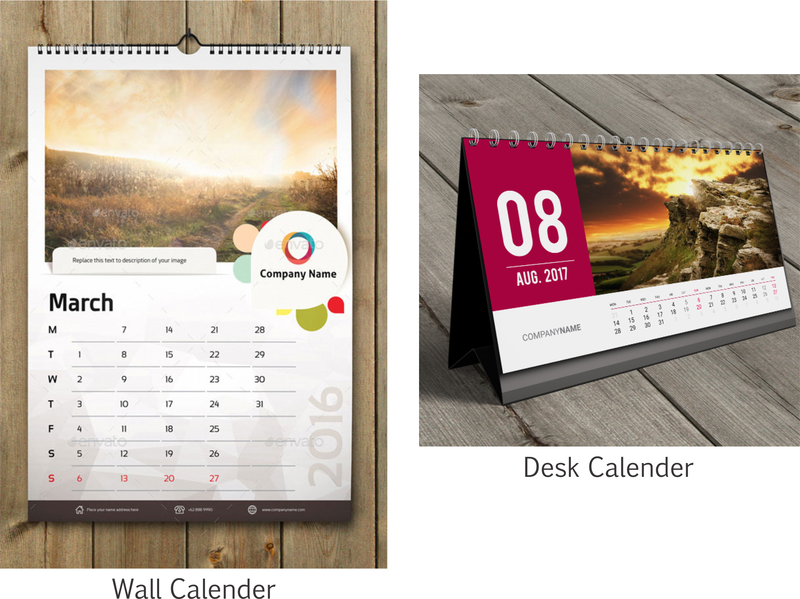 Our wall calendars are available in variety of sizes and printed on your choice of five premium paper stocks. Multiple month formats, binding and hole drilling options are offered as well. Our desk calendars are printed in a 8.5” x 5.5” horizontal size, with your choice of two wire-o color options, and a thick tented base. Printed on two quality paper stocks.